Student participation in all special 8th grade activities requires meeting of the academic standards as well as positive citizenship and good behavior. Please read the following information carefully with your son/daughter. This information is also noted on page 8 of the online Agenda Book. In addition, the principal will review this information with all 8th graders. 2. Earn no more than one (1) U in citizenship as a final grade for the 2nd semester. 3. Earn no administrative U’s; referrals to the office, suspensions, or truancies may result in an administrative U. 4. Administrative transfers and any involvement relating to drugs, alcohol, graffiti, violent behavior, or weapons may exclude a student from the promotion ceremony and end of the year activities. 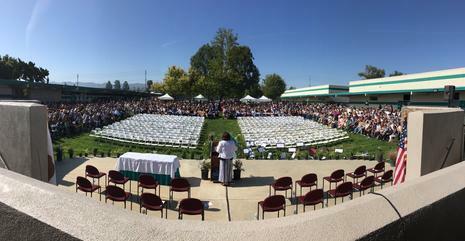 TIME: 9:15 am - Students need to report to the blacktop and stay there until they are lined up for the ceremony. 6/7th graders need to be able to get to class. We anticipate the ceremony to last approximately 90 minutes once we begin. PLACE: Sinaloa MS Amphitheater - The amphitheater area does NOT provide shade. The use of umbrella’s during the ceremony is prohibited in order for ALL guests to be able to see the stage. We will have some canopies set up in the back of the seating area for those who need shade. There will be water available for purchase. SEATING: There will be enough seating for all. We ask that children at the ceremony stay with family. If siblings/friends are being checked out of Sinaloa MS to attend the ceremony, they can be checked out by PARENTS ONLY! No exceptions as this is a safety issue! PARKING: Parking will be available on the athletic field. You are to follow the directions of the parking staff as to where to park! Vehicles with state issued Handicapped parking placards should follow the directions of the parking staff for handicapped parking. We have limited spaces available. NOTE: Siblings who will be attending the promotion ceremony can only be checked out of school by their parents…NO EXCEPTIONS! School will be in session on Friday, June 7th from 8:15 until 12:35pm. It is a regular school day for all students in grades 6, 7th, and 8th. Miscellaneous Info: School will be in session on Friday, June 7th for all students 6-8th grade. Should parents choose to call their student in for a personal day is a choice that a family can make. Otherwise should a student NOT be at school on Friday, June 7th they will be marked as truant. Clearing Obligations: In order for students to receive their promotion certificate ALL school obligations (PE Locks, Textbooks, Library Books, fines, etc.) MUST be cleared by 3:00 PM on Tuesday, June 5. Checks cannot be accepted for payment at this time of the year. Our main objective with regard to dress for this wonderful celebration is to have a dignified ceremony and not take away from the importance, as well as to recognize students and not have it be a “one up each other” with regard to dress choices. School dress code with regard to hair applies for the ceremony! Remember that this is a middle school promotion ceremony! Students should be dressed in a way that is modest and not like a high school prom. Simple but classy! Similar to what we asked of our 8th graders for Portfolio Day! Girls should wear dresses or dress pants/shirts, boys should wear dress pants and a collared shirt. Ties and jackets are optional. All students will be sitting outside in the sun and walking a distance to their chairs… so comfortable shoes are a necessity! Promotion Rehearsal will be held on Wednesday June 5th (date subject to change). Students MUST attend rehearsal in order to participate on THURSDAY! After rehearsal students will go back to their classes for the rest of the day. IF STUDENTS ARE CHECKED OUT OF SCHOOL AFTER REHEARSAL IT CAN ONLY BE BY THEIR PARENT OR GUARDIAN. EMERGENCY CONTACTS OF FRIENDS CANNOT CHECK STUDENTS OUT OF SCHOOL!! Payment flyers will be sent home and available in the office. A pdf version is attached to this announcement. Payments are to be brought to school on April 10th. Please do not send or drop off payments to Sinaloa Middle School for your student before that date. Promotion Video and Photo Package available from Diana Woolley Photography.